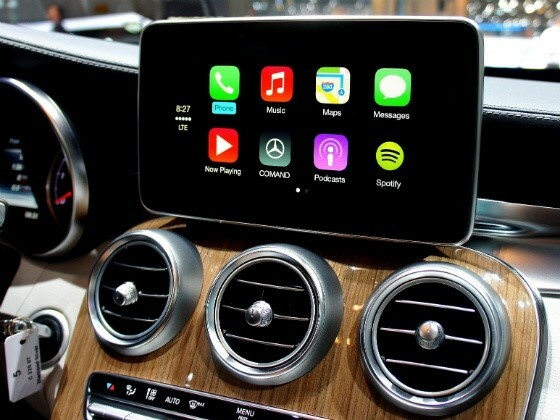 Mercedes-Benz is planning to introduce Apple’s CarPlay operating system in the first quarter of 2015 .To our surprise it can be integrated in all the Mercedes cars ( Now we call it as iMercedes) . Carplay is a wonderful infotainment system for iPhone and other apple users,it helps in customizing the journey with your favourite music environment. CarPlay has been designed to best sync Apple mobile devices like the iPad and the iPhone to the car’s infotainment package like the central screen and audio speakers. The CarPlay OS will also help users use certain relevant apps like email, SMS and other social media apps on the go using the car’s interface directly. Apple Carplay will also help users to use functions like voice commands, maps and of course, general Bluetooth telephony with more ease than currently possible. When unveiled as iOS in the Car during the opening keynote of the Apple Worldwide Developers Conference (WWDC) on June 10, 2013, the system was later formally renamed CarPlay on March 3, 2014, at the Geneva Motor Show. The apple’s Carplay was expected to arrive in end of 2014, but Mercedes-Benz have claimed that they have had some initial issues with syncing Apple’s software to the hardware and interface. The issues faced with security in terms of hackers and electronic attacks on the car have also been taken under consideration with both Apple and manufacturers like Mercedes-Benz working extra hard to ensure the car remains and independent entity that is only controlled by the driver/owner.